I am not sure what it says about us here, that we hadn’t noticed that we were missing one set of hedge clippers. All I can say is that it was not the good pair. But when Mark went to give the Michelia yunnanensis (syn. Magnolia dianica) Honey Velvet its annual or biennial trim, lo and behold, there were the clippers providing a perfect platform for the nesting blackbird family. In vain does Mark protest that he has no idea how the birds got the hedge clippers up there. We know, and never again will he be able to deride me for my carelessness with secateurs and trowels which frequently lose themselves in the compost heap. 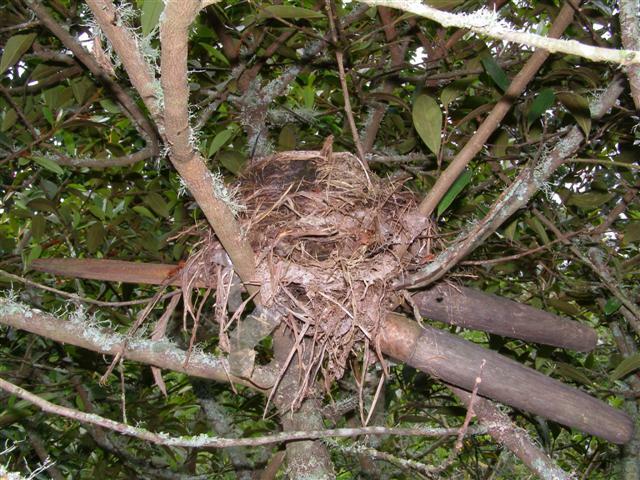 This entry was posted in Seasonal garden guides and tagged Abbie Jury, hedge clippers, in the garden this week, nesting birds on 8 December 2009 by Abbie Jury. That certainly is a puzzle,just how the heck did those birds manage that???? ?